Specifically tailored and custom built, some our most successful website designs for lawyers, doctors, and other service businesses are listed below. Browse through some of our best website designs to see various features and designs available. Website design is driven by high-quality content and visible through SEO, so don't forget to pay attention to those aspects of your medical practice or law firm's web marketing. It can be hard to spot that you’re being taken advantage of if you’ve never worked with a marketing team that is the right fit. This is essentially the situation Simone DeLoach found herself in when she became Director of Marketing at DeLoach, Hofstra & Cavonis, P.A and why she started working with our marketing services team. John Griffith, founder of GriffithLaw, first met with Tom and Chad at a Great Legal Marketing Summit. “We clicked right away,” John says. He walked away from that meeting impressed by Foster Web Marketing’s professionalism and genuine interest in his needs and concerns, and he ultimately chose us to build a new website and provide marketing services for his firm at that time, Griffith & Roberts. Read more about the story that led to John Griffith's success today. The Law Offices of Molly B. Kenny has been a long-time partner of Foster Web Marketing and has benefited from many of our marketing services over the years. After a site redesign, new marketing strategy, and goal recalibration, leads continue to increase—proving that a long-term strategy and consistent site upkeep pave the way for success. Named to Best Lawyers in America, Keller & Keller is one of the nation’s leading personal injury and wrongful death law firms. Our client had roaring success implementing guidance from our Strategic Consulting program, increasing his site's organic traffic by over 300 percent in one year, and increased leads by 89 percent. DeLoach, Hofstra & Cavonis are consistently getting great reviews on a wide variety of sites. Learn how they became a reputation management success story! Attorney Jim Dodson's web design makes the most of video, using informative video clips in a highly effective way. Since the redesign, traffic has gone up 165%. Since Cuddigan Law launched their website redesign in June 2016, the site has seen a 150% increase in conversions. Bob’s practice is very focused. Because of these specific needs, we had to build him a site that would attract and convert this highly targeted demographic. 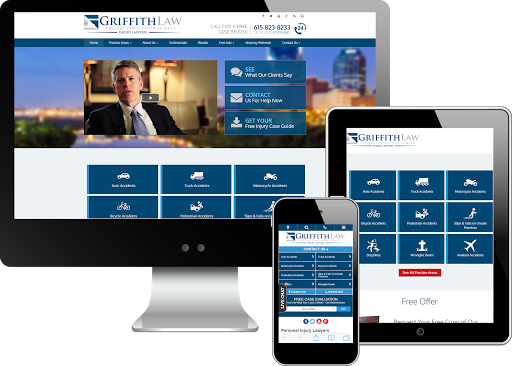 A responsive design and lightning-fast mobile and desktop load times make this law firm's website award-worthy! This completely custom site focuses heavily on the Zauzig Trial Group’s best personal assets, creating a sense of community and connection. Through their user-focused custom site design, Austin Foot and Ankle Specialists have been able to attract and convert their most desirable patients. Since the 2016 redesign of Family Foot and Ankle's site, the team has seen a 37% increase in organic traffic, and the bounce rate has gone down by 60%. Since the launch of their site, Indiana Podiatry Group has seen exponential growth in new patients coming from the website. In 3 months this dynamic website, including a custom-built interactive foot widget, has helped triple the number of contacts the podiatrist has received! Podiatry Associates is able to generate many new patients across a wide area through their professional, uncluttered, easy-to-read and, user-friendly website. The Westminster School website uses real images of students and staff, and a great focus on navigation to direct visitors to highly-sought pages. By creating tons of educational content, Travis Watkins shows his potential clients that hiring an attorney is affordable and desirable. Former Redskins star Brian Mitchell's site focuses on his philanthropy and career highlights, so he is able to inspire users and generate quality leads.